Monster Energy Yamaha Factory Racing’s duo of Romain Febvre and Jeremy Van Horebeek are poised to debut the all-new 2018 Yamaha YZ450FM at the biggest and most popular off-road event of the year, the Monster Energy Motocross of Nations, this weekend at Matterley Basin, Winchester, England. The Monster Energy FIM Motocross of Nation’s is the most prestigious motocross event on the calendar. It is a team race – the only one of its kind – where riders with the same nationality are put into teams of three. Each rider will compete in two races which will give each team a total of six race results at the end of the day. Only the five best results will contribute to the overall score. The most anticipated event of the year will see Monster Energy Yamaha Factory Racing’s duo of Romain Febvre and Jeremy Van Horebeek debut the revolutionary 2018 Yamaha YZ450FM, a bike that has been completely overhauled and redesigned from the ground up. Described as lighter, narrower and more compact, both riders agree that the cutting-edge improvements to the all-new YZ450F offer extra stability and control over rough terrain, better braking, and even greater traction. Both riders will be lining up on the ‘works’ version of the bike, the YZ450FM. Representing the defending champions, Romain Febvre will be lining up for Team France for the third time in his career. He has been on the team for the last two-years and has won his class and the overall on both occasions. Jeremy Van Horebeek has been a staple in the Belgian team since his MXoN debut back in 2007 where he was able to celebrate with a bottle of champagne on the third step of the podium. He has remarkably represented his country, Team Belgium, nine-times, of which, he has landed on the podium seven-times. This weekend he hopes to replicate the same sort of ‘Nations’ success he has become so accustomed to. Adding to Yamaha’s presence this weekend, Australia’s own Yamaha ace Dean Ferris will be lining up for Team Australia. Ferris has also been invited to join former Yamaha heroes Paul Malin and Jeff Emig on the live Studio Show which will be broadcast on MXGP’s official Facebook page at 9am GMT-0 on Saturday 30th of September. 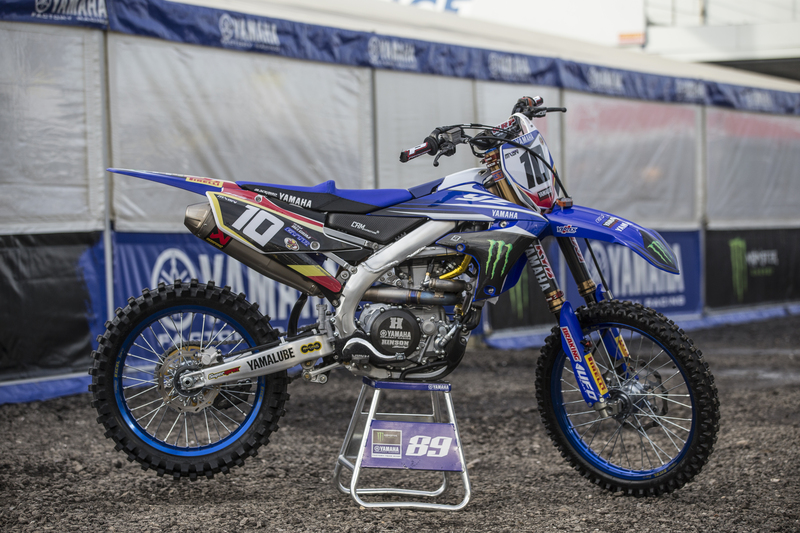 Wilvo Yamaha Official MXGP’s Arnaud Tonus has a shot at stealing the crown for Team Switzerland. In addition, Karlis Sabulis will be making his 450cc debut for Team Latvia, while his ASTES4-TESAR Yamaha Official EMX250 teammate Jan Pancar will be riding a YZ250F for Team Slovenia. Kemea Yamaha Official MX2’s Brent Van doninck will join Jeremy Van Horebeek on Team Belgium, while fellow YZ250F rider Alvin Östlund will be racing for Team Sweden. This weekend, the Monster Energy FIM Motocross of Nations will be taking place at the same venue that has staged the British Grand Prix every year for the last six years, Matterley Basin. It is also the same venue that hosted the Motocross of Nations back in 2006, an event that is often referred to as one of Britain’s best. The event will kick-off with practice sessions on Saturday morning followed by the Qualifying Races for MXGP, MX2 and Open starting at 1:30pm GMT-0. On Sunday 1st October, the racing will start at 1:30pm GMT-0.